Fractures of the bones of the spine (vertebrae) can occur as a result of trauma, osteoporosis (loss of calcium resulting in decreased bone strength) or as a result of tumor within the bone. Approximately 700,000 vertebral, or spinal bone, fractures occur each year, usually in women over the age of 60. Osteoporosis itself does not cause back pain. However, osteoporosis can weaken the vertebral body (spine) so that it can no longer withstand normal stress or a minor trauma (e.g. a fall), all of which can result in a fracture. In fact, a fracture is typically the first outward sign of the disease. Tumors in the spine are not uncommon conditions and can bring about fractures as a result of severe weakening of the bone. Ultimately, spinal fractures often result in moderate to severe pain that greatly impacts the patient’s ability to function day to day. The spine is a flexible column formed by a series of bones called vertebrae, each stacked one upon another to support the head and trunk. The spine is made up of 33 vertebrae: 7 cervical, 12 thoracic, 5 lumbar, 5 sacral (fused into one), and 4 coccygeal (fused into one). The vertebrae most commonly affected by compression fractures are one or more of the thoracic or lumbar vertebrae. The intervertebral discs are located between the vertebrae from the second cervical vertebrae to the sacrum. They vary in size, thickness, and shape at different levels of the spine. The purpose of the intervertebral discs is to cushion movement. The spinal cord is a slender nerve column that is protected within the spine. It passes downward and terminates near the last thoracic and the first lumbar vertebrae. The spinal cord consists of 31 segments, each of which gives rise to a pair of spinal nerves. These nerves branch out to various body parts to connect them with the central nervous system. 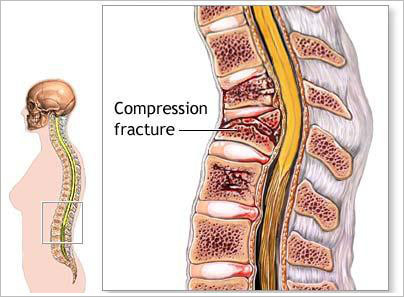 Vertebral body compression fractures may be treated with medications, surgically or with minimally invasive procedures known as vertebroplasty and kyphoplasty. Performed approximately 75,000 times a year in the United States, vertebroplasty is designed to reinforce the fractured bone, thus eliminating the debilitating pain suffered by patients with compression fractures. Originally developed in the mid-1980’s in Europe, this procedure was eventually brought to the United States in the early 1990’s by two interventional neuroradiologists, Lee Jensen, M.D. and Jacque Dion, M.D. Vertebroplasty is performed by first inserting a special needle into the affected vertebrae under fluoroscopic (x-ray) guidance. When the needle tip is in position, a cement mixture is injected into the affected vertebral body. When sufficient amounts of the cement are injected into the damaged bone, the needle is removed and gentle pressure is applied over the puncture site. No stitches are required and the patient is left only with a band-aid. The patient may then go home an hour or 2 after completion of the procedure. Almost all patients experience complete and immediate relief of the severe pain caused by the compression fracture. Kyphoplasty is a technique originated in the late 1990’s and established in 2001. Also a minimally invasive procedure, kyphoplasty is conducted by inserting a balloon into the crushed vertebra via needle under X-ray guidance, expanding the balloon to create a cavity or void space within the bone tissue, and then withdrawing the balloon and inserting in its place a cement-like substance which ultimately serves to stabilize the vertebra. Most patients undergo both of these procedures on an outpatient basis and are allowed to leave the hospital within a few hours of the procedure. Activities at home may be limited at first and slowly increased as tolerated. Strenuous activity such as heavy lifting should be avoided for up to one week; e.g., nothing heavier than a pocketbook or a small bag of groceries. If the pain is not alleviated by either of these procedures, the patient should be re-evaluated for other possible causes by his/her referring physician. In some cases, similar pain can occur in a different location which may indicate that the patient has developed another fracture. Depending on the specifics of the patient’s condition, he/she may be referred to a physical therapist or other rehabilitation services as needed.